The Beirut daily al-Akhbar, which is a leading mouthpiece for Syria in Lebanon, claims a tipoff from U.S. intelligence is what brought about the arrest by Lebanon’s General Security Department of Syrian opposition supporter Shadi al-Mawlawi in Tripoli. The arrest -- linked to unrest in neighboring Syria -- sparked off three days of clashes between Lebanese Alawites and Sunnites in Lebanon’s second largest city that has recently become home to thousands of Syrian refugees fleeing the violence in Syria. 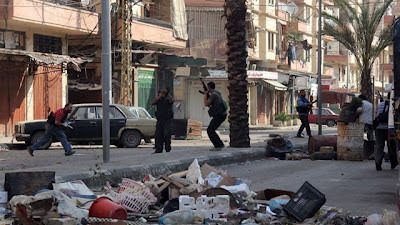 The faceoff since Saturday between Tripoli's two adjacent districts -- the predominantly Sunnite ‘Bab al-Tebbaneh’ and the overwhelmingly Alawite ‘Jabal Mohsen’ -- has left eight people dead and about 80 injured. The General Security Department arrested Mawlawi, a Lebanese Sunnite Islamist opposed to the regime of Syrian President Bashar al-Assad, after luring him to a government minister’s welfare association office to supposedly receive healthcare assistance. Lebanese security separately arrested other men, including one Jordanian and one Qatari. According to al-Akhbar, “several (Lebanese) security officials say U.S. security agencies informed the General Security Department that a Jordanian by the name of Abdelmalek Abdessalam had crossed into Lebanon from Syria and is about to leave the country. “The Americans said Abdessalam coordinates al-Qaeda activities in several countries, among them Afghanistan, Iran, Pakistan, Syria, Lebanon and Jordan. The General Security Department having alerted the border crossings, Abdessalam was held at Beirut International Airport when trying to board a flight to Amman. “Abdessalam confirmed the suspicions against him during interrogation… He admitted receiving funds from a Qatari citizen, Abdelaziz al-Atiyah, who was also seized at his hotel (in a Beirut suburb), where he was recovering from surgery. He has now been moved to a hospital in Mount Lebanon. Lebanese army regulars and police forces are today patrolling Tripoli and seem to have restored calm. The army said in a statement its units finished deploying in the violence-stricken areas of the city, including Bab al-Tebbaneh, Jabal Mohsen and the Syria Street separating the two neighborhoods bitterly split over loyalties linked to the Syrian uprising. The number of Lebanon’s Alawites is undetermined, varying between a high of 120,000 and a low of 70,000. About 60 percent of them reside in Jabal Mohsen. Most of the rest live in the north Lebanese governorate of Akkar. No Alawite has ever been named government minister in the Republic of Lebanon’s history. And it was only three years after the 1989 Taef Agreement that Alawites were able to fill their two allocated seats in the 128-member Lebanese parliament. Both Alawite legislators in the current parliament – Khodr Habib and Badr Wannous – were elected on a (anti-Assad) Future Movement ticket. Lebanese political analyst Rosanna Boumounsef today notes in her daily column for Beirut’s independent daily an-Nahar the Syria crisis has left the government of Prime Minister Najib Mikati in a quandary. “You cannot dissociate events there from the diligence of some security agencies – apparently motivated by Syria – in deeming Salafism an absolute evil. I wish one of these agencies’ bigwigs would come forward to define to us Salafism. “Why this dogged insistence on magnifying the Salafist threat? How pervasive is it in Lebanon? Is it restricted to Sunni Muslims? Why is it constantly linked to terrorism…? “Aren’t we being led to believe Lebanon has become a Salafist hub so we cutoff help and humanitarian assistance to Syrian refugees in Lebanon and (acquiesce) to the arrest of activists among them who would then be handed over to the authorities in Syria to face execution? “And why this determination to ‘import’ al-Qaeda to Lebanon at all costs? Will al-Qaeda also be used as a scarecrow to gag Lebanese support for the Syrian revolution and the Syrian people who are facing the systematic and daily crimes being committed by the regime in Syria? “…Why the lack of full coordination among all Lebanese security agencies? Is it because each has it own political patron? “…Does this explain why telecom date was not released to a security branch trying to uncover the persons behind the attempt on the life of Lebanese Forces chief Samir Geagea?